Pet Rehabilitation is movement and strengthening of joints and muscles for the purpose of better structural support. In people, if you have joint surgery, the physical therapist is by your side shortly after you wake up to start working your muscles and joints. Yet in veterinary medicine, it is “status quo” to have forced rest so that the pet doesn’t “overdo it.” Just like us, when pets have an injury they return to function better and faster when the joints and muscles are gently returned to function. 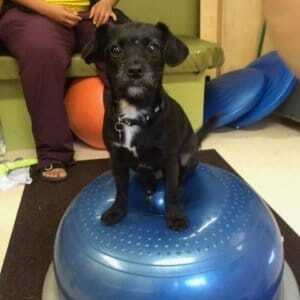 Canine rehabilitation physical therapy can be very helpful. Animals that maintain healthy lean muscle mass and smooth flexibility have decreased pain and better quality of life long term. Just like in humans, if we eat right, we still may not lose weight. How many times to we hear “diet AND exercise.” I can help you design a diet and an exercise regime that not only helps your pet lose weight, but also increase lean muscle mass so they are protected from injury, burn calories faster and have more energy to do the things dogs are supposed to do. Obese cats are quite misunderstood because we tend to think of cats as lazy. Weight loss for kitties is all about short bursts of lean muscle work. Along with diet, I can help you get your kitty to exercise in the way that kitties should. Just like human athletes, canine athletes perform better when they are cross trained. Conditioning with rehabilitation equipment tightens the core and targets muscles for their sport to help prevent injuries common to the sport. Healing Arts Animal Care provides veterinary acupuncture, pet rehabilitation therapy, physical therapy and athletic conditioning to the dogs and cats of Portland, Oregon area. We strive to create a team among you, your pet, your veterinarian and ourselves to create a whole package of care for your pet. Pets come through our door knowing that we’re going to have fun here and this isn’t “another trip to the vet.” Through manual therapies, acupuncture, laser, ultrasound, underwater treadmill and creating a tailored individual home exercises, we strive to bring your injured pet back to speed, keep your elderly pet as an active member of the family, return your obese pet back to a functional friend and keep your athletic pet at the peak of his performance.